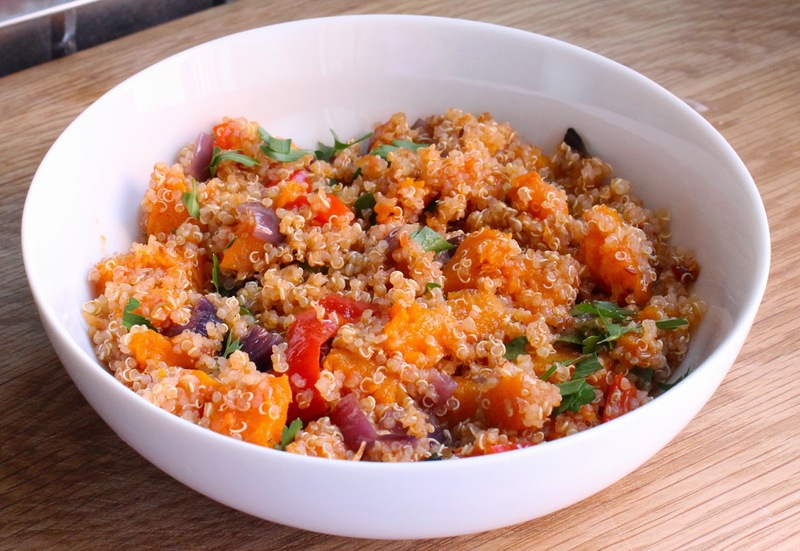 Quinoa with Roasted Butternut; find out how to cook quinoa. With all this lovely weather we're having at the moment BBQ weather will soon be here. As a change and feeling in a healthy eating kinda mood, I felt the need to cook quinoa. Quinoa (pronounced keen-wah) is marvelous stuff and although a little on the weird looking side, it is actually rather nice to eat and is good for you too. That said, of course it does need some love to make it nice as alone it can be a bit tasteless. But if you add a glug of oil (ha-ha) and some roasted veg along with a dollop of sun-dried tomato paste and it turns into a lovely thing indeed. Now I have to admit to adding a little crumbled feta after this picture was taken but since I'm trying to come across all healthy and that - just don't tell anyone! Quinoa is a complete protein unlike wheat or rice and contains all eight of the essential amino acids. It has been recognised by the United Nations as a super crop for its health benefits: packed with dietary fibre, phosphorus, magnesium and iron. It's also gluten-free and easy to digest which all goes to suggest it is as close the most perfect ingredient you can get. Before cooking it looks like tiny beads - you need to rinse it well or it will taste bitter. Then pop into a saucepan (please note 1 cup of uncooked quinoa will turn into about 3 cups when cooked) so allow a big enough saucepan or you will have trouble! Cover with plenty of water and bring to the boil then turn down to simmer and cook covered with a lid for about 20 minutes or until it looks transparent. As a change and feeling in a healthy eating kinda mood, I felt the need to cook quinoa. Quinoa (pronounced keen-wah) is marvelous stuff and although a little on the weird looking side, it is actually rather nice to eat and is good for you too! Cook your quinoa to the instructions on the packet (some quinoa needs to be soaked before cooking and some doesn't) Rinse, drain well and set aside. Put the prepared butternut, pepper and onion onto a non-stick baking sheet and drizzle with olive oil then season with sea salt and pepper. Using your hands, coat the veg well with the oil. Pop into the preheated oven for about 20 minutes before turning, then return to the oven for another 10 or 15 minutes or so. The butternut should now be cooked through but you can test with a sharp knife to see if it's nice and soft. Remove from the oven and transfer to a chopping board to cool. Once cold, dice into 1 cm pieces and transfer to a bowl. Stir in about a tablespoon of sun-dried tomato paste and coat well. Add the cold, cooked and drained quinoa along with the chopped parsley, drizzle with a little more olive oil. 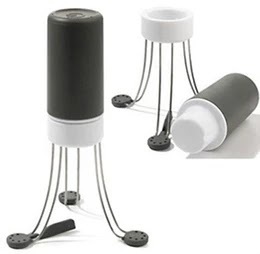 Mix together, have a taste and adjust the seasoning and serve. Oh I am liking that Jan and my stomach is grumbling just looking at it. I've not had quinoa for a while. Must have this soon!